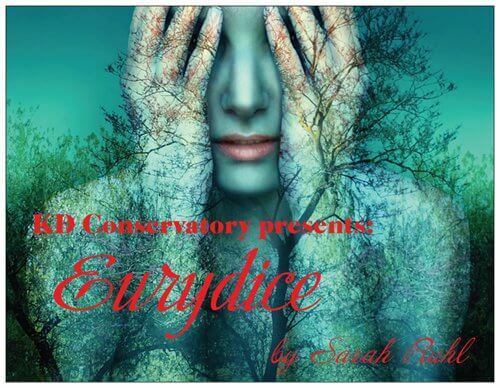 KD Conservatory College of Film and Dramatic Arts is proud to announce their Spring theatrical production of Sarah Ruhl’s Drama Desk Award-winning play Eurydice. Eurydice is under the direction of KD Acting Professor Sarah Rutan, a former seven-year company member of the famed Oregon Shakespeare Festival. The play opens March 29th, followed by performances March 30th and 31st, and April 5th through April 7th. All Friday and Saturday night performances are at 7:30 pm and the Sunday matinees will be at 2:00 pm. Performances will be held at the T.A. Taylor Theatre at the KD Conservatory Campus, 2600 N. Stemmons Freeway, Dallas, TX 75207. Tickets are $15 for adults, $10 for students, and $5 for KD Conservatory students and alumni. Tickets are available at the box office at KD Conservatory (214) 638-0484 and online at brownpapertickets.com. In Eurydice, Sarah Ruhl re-imagines the classic myth of Orpheus through the eyes of its heroine. Dying too young on her wedding day, Eurydice must journey to the underworld, where she reunites with her father and struggles to remember her lost love. With contemporary characters, ingenious plot twists, and breathtaking effects, the play is a fresh look at a timeless love story. Kevin Rhodes as Orpheus and Caroline Wagner as Eurydice in KD Conservatory’s production of Eurydice by Sarah Ruhl. Photo by Edwin Williams. 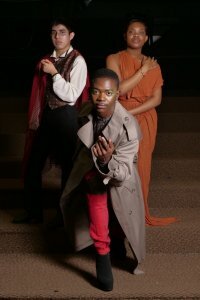 (From left to right) Christian Medina, Matthew Johnson, and Kennedy Williams as The Three Stones in KD Conservatory’s production of Eurydice by Sarah Ruhl. Photo by Edwin Williams. Celebrating 40 years of professional training, KD Conservatory is dedicated to the development of actors and filmmakers and to the creation of avenues into the professional world of entertainment. KD’s students develop skills that enable them to realize their full potential in the theatre and film industries in a supportive and creative environment. 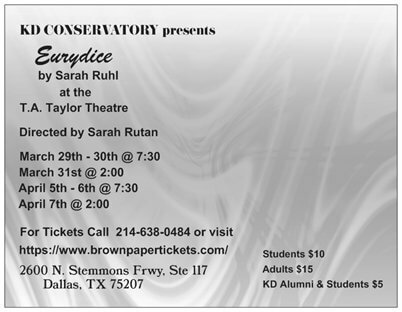 If you would like more information about KD Conservatory’s play Eurydice by Sarah Ruhl, or their degree programs and workshops, please call (214) 638-0484 or email admissions@kdstudio.com. Visit us at kdstudio.com.